An apparent demonstration of superior brain power. Any number between 1 and 100 is cubed by a spectator, and the final result called aloud. The performer immediately extracts the cube root of this number without the use of electronics, stooges, or gimmicks. The calculation is performed immediately and entirely in the performer's mind, thanks to the secret master key. This feat, performed on paper after a lengthy effort by a spectator, is considered quite an accomplishment, but performed instantly, it is a sensation. 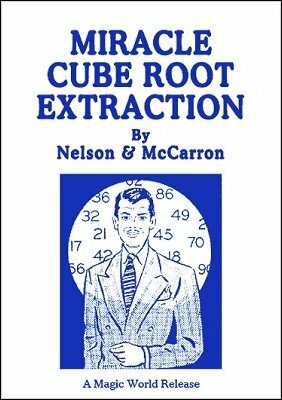 Performer knows only the number submitted by the spectator, and immediately extracts the cube root. Suitable for and will be appreciated by any intelligent gathering of people. Great for luncheons, banquets, and stage presentations. Aside from impressing your friends or using it to win bets at the bar, you'll impress reporters, prospective employers and others with your numerical agility. NEW TO THIS EDITION! McCarron tips his method of tripling the number of promotional letters for your press book. This secret alone is easily worth three times the price of the book to any working performer. Are you a Nelson collector? This manuscript was listed as No. 256 in the Nelson Enterprises catalog . 1st edition 1931, PDF 20 pages.